Pure Coffee Blog: CC: Brew Ha Ha! Walking the city on a cool summer night tends to be a very relaxing activity (though my fiance' would tell you otherwise; she doesn't like wandering). Yet what Philly boasts in serene walks it lacks in evening business hours, especially in coffeehouses. Now, you may exclaim "Who drinks coffee at night!?" and I will tell you that many would rather gather at a coffeehouse for decent java then a noisy nightclub. But I digress. Brew Ha Ha! is one of those places that I always managed to pass at night, when it was closed. I never really came in the area any other time, but I figured one day I'd hit it when it was open. That day came one recent, humid summer day when I had some time to kill one Friday afternoon as I waited for a friend. I was walking along 12th St, looked up and there before my eyes it stood open and buzzing with customers. The shop is in an old building with beautiful front windows and a nice exterior paint job. The inside is very expensively and stylistically designed, with really nice furniture and some beautiful pieces of art. But the pleasantries stopped there. The coffee was La Colombe, a tedious cup of joe that constantly fails to serve up to its hype. The espresso was pulled rather well, but the espresso itself came out jagged with a charred finish and a bitter aftertaste (I deduce it was more the espresso then the barista or machine). I failed to note the tea. 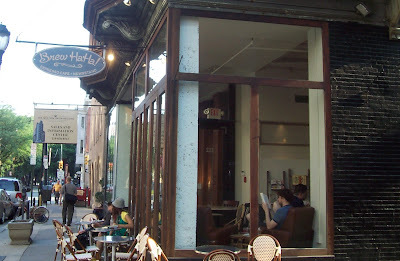 While Philadelphia has many coffeehouses, Brew Ha Ha! joins many other Philly coffee establishments in the realm of mediocrity (can't say I'm surprised, as its West Chester location faired no better). If you're looking more for a place to hang out with friends during the day and not so much a stellar espresso, try Brew Ha Ha!. Turns out that the West Chester location (Cream and Sugar Cafe) is no longer a Brew Ha Ha! branch. My mistake! Soon after writing this post, Brew Ha Ha! shot me an email to notify me that they were dropping La Colombe because of poor quality and picking up another East Coast roaster, Caffe Pronto out of Annapolis. When I heard this, I jumped clear out of my seat (figuratively) as Caffe Pronto not only has a reputation for knowing what they're doing but I've had the good pleasure of sampling some of their coffees at Doubleshots on nearby Strawberry and 2nd. Just recently I made my way over to their 12 St location to see if indeed the news was true. To my distinct pleasure, I saw the big bags of Caffe Pronto sitting behind the counter and the new coffee offerings prominently displayed. The coffee was a house blend (endemic to Brew Ha Ha!) which surprisingly blew me away with a variety of flavors and fullness (many times the house is a so-so breakfast blend). The espresso, pulled decently, also tasted so much better with a glowing acidity and wonderful body. Apparently, some time this past autumn '08, Brew Ha Ha! began roasting their own coffee. I decided to stop at their Limestone Rd location to try out the new beans and sadly, the experience left me in want. The drip of their Kenyan had some nice notes of bright acidity and berries, but the coffee had the overpowering bite of over-roasted beans. The espresso fared no better, as the shots were pulled a medium length with little crema and embodied some heavy bitterness, though there were slight redeeming shadows of peanut and vanilla. Overall, I have to say this experience left me a little depressed, as the place had a lot of promise as per my last visit. Hopefully this was just a really bad day and things are not as bad as they seem. It has been some time since I have updated this post! In the past 9 years, Brew Ha Ha! went from a one-trick pony to a multi-faceted organization. Now using their compatriot coffee roaster Brandywine Coffee Roasters, the many Delaware Brew Ha Ha! locations are at various stages of "good." Their Greenville and Dupont St, cafes deserve all the laud of top-notch shops, with excellent individual brew options and plenty of great menu items, all within some of the best atmosphere in the region. Some of the other cafes do not boast the same brew options and tend to sport a good deal more on the dark roast options (not a plus in my book). Thus all in all, I strongly recommend Brew Ha Ha! but note that not all locations are created equal.